There are other ways to make a living in music. Although it’s fairly easy to make some money with music, it’s never easy to make a living from music. Sure, you can get a pittance per stream, or sell a few albums online, and there may even be enough money in the local pub’s tip jar for a trip to the supermarket. But not only are there fewer venues for playing live, selling recordings is challenging. While the Internet has ‘democratised’ music, this has also made the competition stiffer than ever because there’s no barrier to posting music online (like CD duplication costs). Besides, consumers can hear almost every piece of recorded music ever created for free. You’re not just competing with the band down the street but with all the greats of the past, from ABBA to ZZ Top. It’s not enough to be ‘the next Prince’; you have to be better than Prince. Some ways to make a living from music may not offer the ego gratification of being on stage, but I think most musicians would rather make a living from something music-related than something that isn’t — and this means not limiting your love of music to a single career path. Doing music for videos and commercials is one possibility. Watch late-night TV until you see a local company’s commercial with bad audio. Go to the company, say you can do a much better job and you’ll prove it by doing a commercial’s audio for free, and if they like it, they can use it. That will be the start of your ‘reel’, and then you target the next company under the same terms. Next, you take those two examples to another company, but this time you charge money... and you’re on your way. Or consider Sweetwater’s sales engineers, many of whom play in bands or studios without having to figure out how to pay the bills solely from playing. For them, music becomes a no-pressure, fun activity (and, of course, a band having fun is also what pleases audiences). As a side benefit, they’re immersed in gear knowledge ahead of the general public, and when they talk on the phone, it’s with other musicians. So yes, they’re helping people choose and purchase the right gear, but they’re also immersed in the world of music. There are also opportunities in writing about gear and music — Sound On Sound is proof of that! Despite a misconception that good writers are born, not made, that’s true only for writers who get it right on the first draft. Good writing is also about self-critical editing, and you get better over time. Phil O’Keefe of Harmony Central, who started as a studio owner/engineer but is now a highly respected writer, wrote horrible first drafts. But he learned to edit his articles, improved his craft, and landed a full-time gig writing about music and gear. One of the reasons he’s good is because he still works regularly in the studio, so his articles have the authority of being written under real-world conditions — as are articles written by SOS staff, most of whom are active musically. Some musicians have created cottage industries selling presets, sample libraries and the like. Yes, it’s a competitive field, but the cream rises to the top. 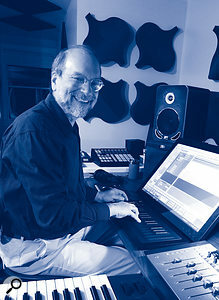 For example, Glenn DeLaune has specialised in creating patches for products from Line 6, Fractal and Boss. He does good work, his customers love his presets, and he’s been able to create a significant income stream. Also, the music industry is very naive about marketing, which is all about telling the story of a particular product. I’ve seen musicians with zero marketing experience do better at marketing musical products than some high-priced marketing executive from a company outside the music industry, because the musician can explain a product’s gestalt with enthusiasm that’s backed up by hands-on experience. Marketing gigs can also pay very well, of course. Sure, these opportunities require you to have particular skills and the ability to market yourself, but so does ‘making it’ in any aspect of anything. Don’t let fear of the unknown keep you from taking steps into a different, but still music-related, world. I’ve been doing it for decades and the irony is that I’m making more music now, and enjoying it more, than I did when I was doing those six-nights-a-week-for-six-weeks concert tours. Craig Anderton has worked on over 20 major label releases, and mastered hundreds of tracks. As an author, he’s written over a thousand articles and 25 books, and lectured on technology and the arts around the world.